The SK1000 Twistie is a brand new addition to the product range here at CoreVend. A compact, convenient and easy vend solution perfect for small location vending. 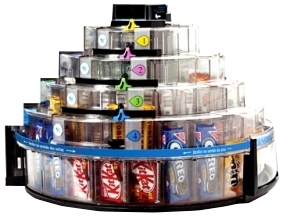 The SK1000 Twistie machine fits neatly into any corner, table or counter top in the office space, turning those previously unservicable sites into money generating locations. - Sturdy reinforced plastic with simple twist operation encourages interaction and allows customers to see their product before they buy. - Unique pyramid design helps to attract sales and encourage repeat custom. - Multi coin mechanism allows customers to enter combination of coins to reach required price. - Machine can vend up to 96 products with each section easily adjustable to dispense larger sized product. - Hugely adaptable machine with ability to vend countless products - crisps, choclolate, sandwiches, sweets etc..
- Can be placed practically anywhere due to its compact footprint. - Simple to load - Sections can be preloaded with stock and simply dropped in.